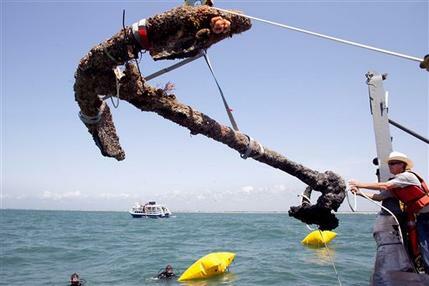 Archaeologists recovered the first anchor from what’s believed to be the wreck of the pirate Blackbeard’s flagship off the North Carolina coast Friday, a move that might change plans about how to save the rest of the almost 300-year-old artifacts from the central part of the ship. Divers had planned to recover the second-largest artifact on what’s believed to be the Queen Anne’s Revenge but discovered it was too well-attached to other items in the ballast pile, said project Mark Wilde-Ramsing. Instead they pulled up another anchor that is the third-largest artifact and likely was the typical anchor for the ship. Apparently, pirates had everyday anchors and special anchors just as the rest of us have everyday dishes and good china. “That’s a big ship to be putting that out to stop it,” Wilde-Ramsing said admiringly as a pulley system of straps and men holding ropes moved the anchor from a boat to the back of truck. It’s the first large anchor that divers have retrieved; they earlier brought up a small, grapnel anchor. The anchor is 11 feet, 4 inches long with arms that are 7 feet, 7 inches across. It was covered with concretion – a mixture of shells, sand and other debris attracted by the leaching wrought iron – and a few sea squirts. Its weight was estimated at 2,500 to 3,000 pounds. The anchor’s size is typical for a ship the size of the Queen Anne’s Revenge, while the two other anchors probably were used in emergencies, such as storms, Wilde-Ramsing said. Archaeologists had planned to remove the second-largest anchor, which is 13 feet long with arms that are 8 feet across, from the top of the ballast pile. But it was too well-attached, so instead the divers went in from the side to retrieve the everyday anchor. That means that future dives may involve going in from the side of the shipwreck rather than the top, he said. Divers will work four days next week, when they’ll decide how to proceed. State officials hope the anchor and other artifacts will attract tourists. The largest exhibit of artifacts from the shipwreck, which was discovered in 1996, will be shown starting June 11 at the N.C. Maritime Museum in Beaufort. Wilde-Ramsing has said the team hopes to recover all the artifacts by the end of 2013. And the timing of the recovery of the anchor couldn’t be better for North Carolina officials, trying to increase tourism interest in the shipwreck. The Disney film “Pirates of the Caribbean: On Stranger Tides” starring Johnny Depp was released earlier this month and features both Blackbeard and the Queen Anne’s Revenge. The only remaining parts of the ship – the wooden hull structure, ribs and a plank – are at the bottom of the pile, protected by ballast that kept the ship upright. Six cannon and three other anchors are also in the pile. Southerly compared the retrieval to the child’s game of Pick-Up-Sticks, where players toss plastic sticks on a hard surface and then remove them one at a time without disturbing the ones underneath. “It’s really satisfying that I’ve had privilege of seeing it,” he said. 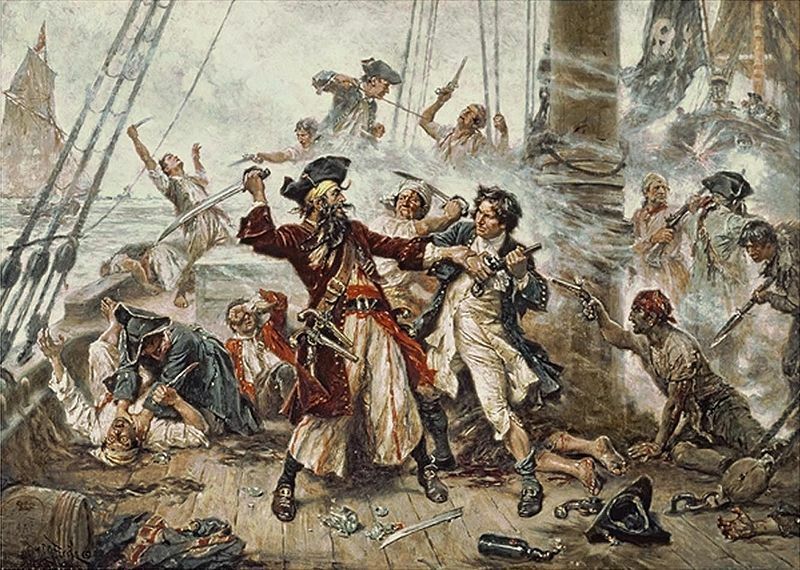 In 1717, Blackbeard captured a French slave ship and renamed it Queen Anne’s Revenge. Blackbeard, whose real name was widely believed to be Edward Teach or Thatch, settled in Bath and received a governor’s pardon. Volunteers with the Royal Navy killed him in Ocracoke Inlet in November 1718, five months after the ship thought to be Queen Anne’s Revenge sank. The Queen Anne’s Revenge shipwreck site, which is listed on the National Register of Historic Sites, has already yielded more than 250,000 artifacts.